Prior military service matters when recommending an Information Destruction solution! Providing information destruction solutions to the US Military can be a challenge….especially due to the security requirements to get onto a Base or Camp or Post. To compound the problem, many military personnel entrusted to find information destruction solutions are not fully aware of the most effective solutions. Access, trust, expertise and education are critical to assisting our Military in protecting the classified / high security data being generated on a daily basis. I spent 20 years of my life serving my country in the United States Air Force. I had a “Secret” clearance during most of my career because of my job specialty. I then PCS’d to a certain base and my clearance was upgraded to “Top Secret” which I kept until I retired. Not only did I gain experience in the nuances of classifieds and the destruction thereof, I also worked as a material control NCO (RM). As most of you who have served in the military have learned, your primary job isn’t always the only thing you do. When you become an NCO, you adorn many “hats”. Some details become hazy as you are tasked with jobs, deadlines and duties which you have to accomplish according to their priorities as it applies to the overall mission accomplishment. I have experienced many facets of classified handling as well as procurement procedures which would be beneficial to my next career as a salesman. After leaving the Air Force I felt a relief but also felt a loss. Twenty years of my life was spent in defense of my country. I missed part of that until I started working for SEM. As a Regional Manager working for a government contractor, I have had the opportunity to once again work with my military family. But this time I wasn’t in uniform. I am now able to help my military brethren with my experience both as a former military member, and as a sales expert in information destruction devices. I have had many opportunities to do this. I have visited many military bases during my sales career and talk with people about how their classified and unclassified materials need to be destroyed. I have spoken at several security managers’ meetings/briefings. During these meetings, I speak about what, how and why certain items should be destroyed and the devices they must use to destroy these items. Many new security managers take on this role as an additional duty alongside their primary job. These meetings introduce the new managers to their duty and tell them what they need to know. I have been complimented for the information I bring because they may not otherwise have the opportunity to gather this. Once again, I bring my prior experience to bear. I recently made a sales call to a USMC reserve center to check on an SEM Model 200 Office Disintegrator that was sold a few years ago. I met a Gunny that was skeptical about bringing a “civilian” into his area to look at a machine he used for destroying classifieds. I explained; the reason I was there was because of our excellent customer support and wanted to see if he had any problems with it and to offer tips on how to get the best performance from it. Again he was stone faced. I started to explain my military career and then took out my military ID card and showed it to him. It was like a door opened because his barriers broke down and he started talking to me about his career and then the machine. We seemed to hit it off after I told him I was retired from the military. He took me back to see the office disintegrator and we discussed its use and how to best use it to get the most performance. He wanted to know exactly what he could destroy in his 200. I explained it could destroy paper, CD/DVDs, thumb drives, floppy disks, audio cassettes and credit and CAC cards. I gave him a demonstration on how to destroy paper and CD/DVS and took him through the procedures to clear a jam. He really appreciated the tips and the time I spent with him. I left another satisfied customer and the satisfaction of helping another fellow military member. In the end, military service matters. It sends a message of trust and allows me to educate, recommend and support the critical information security solutions we offer to help protect our country. 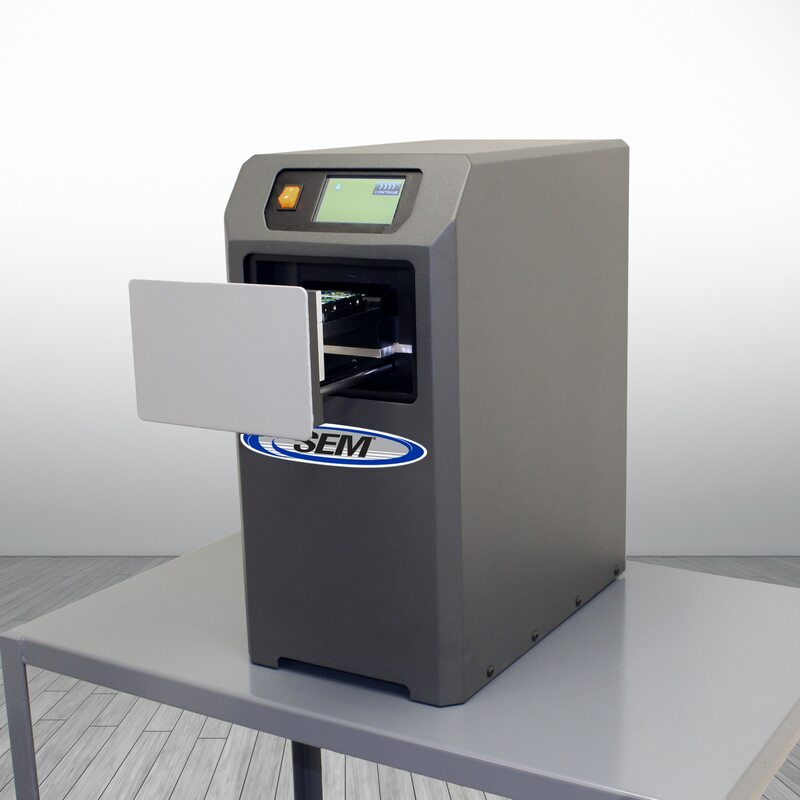 For more information on SEM and the many High Security information destruction solutions that are available to our US Military, visit us at www.semshred.com or call 800-225-9293.